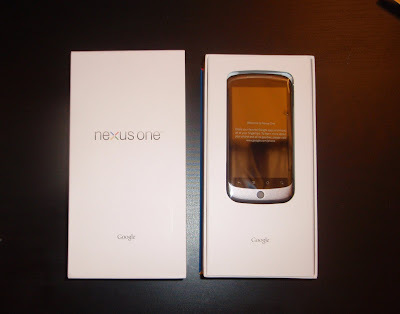 It’s been six weeks waiting for the Nexus One and finally it’s here. The N1 runs smoothly and fast a Cyanogen ROM. Even though I’m using the same 3G connection (vodafone ES), now browsing the web is a delightful experience compared with HTC Magic. The battery lasts almost a couple of days with a normal use (email, web, rss, etc). The parcel didn’t include any sort of manual except a couple of sheets with tips and tricks. Here you can see more pictures. 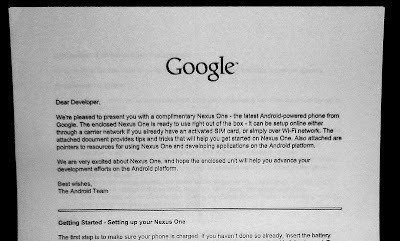 It’s been six weeks waiting for the Nexus One and finally it’s here. The phone runs smooth and fast even using the same 3G connection (vodafone ES), now browsing the web is a delightful experience compared with HTC Magic. The battery lasts almost a couple of days running a Cyanogen ROM. The parcel didn’t include any manual except a couple of sheets explaining tips and tricks. Here you can see some pictures.